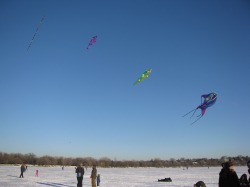 Kites of all shapes, sizes, colors and themes will fly over frozen Lake Harriet on January 27 from noon to 4 pm. This free, fun, family festival includes horse-drawn wagon rides, snowshoeing and guided nature tours, Tips Outdoors providing ice fishing for kids, a marshmallow roast, music, Wild Rumpus Reading Walks and Farmstead Bike Shop Fat Tire Bikes Demo and new this year, Art Shanty. Minnesota Kite Society experts will be on hand to demonstrate maneuvering spectacular kites throughout the day, offer their expertise to kite flying enthusiasts and to those who are new to the pastime. The event is held at the north end of Lake Harriet near the Bandshell (4135 West Lake Harriet Parkway). Free lot parking is available on site, please keep in mind the lot fills quickly, however free, on-street parking is available throughout the neighborhood. Shuttles will be available leaving from Linden Hills Park (3100 W 43rd St. Minneapolis) and Burroughs Elementary School (1601 W 50th St) from 11:45 am to 4 pm. West Lake Harriet Parkway delays are expected. Allow ample time to find a spot and walk to the venue. Bring your own kite or purchase one at the event. Food Trucks will be available to purchase food and hot drinks. ​Tips Outdoors will teach kids ice fishing skills and safety tips. Equipment and permits for children will be provided. ​KiteFest is Sponsored by MPRB Events Department, East Harriet Farmstead Neighborhood Association, and Linden Hills Neighborhood Council. East Harriet Neighborhood Association is looking for volunteers to sell kites at the Kite Festival on Saturday, January 27 from noon to 4pm. Shifts are one hour (or more if can). Noon - 1 pm; 1 - 2 pm; 2 - 3 pm; 2- 4 pm. Contact Deb at info@eastharriet.org. call 612.230.6479. Please be sure to indicate your name and day of event phone number. The skies over frozen Lake Harriet were covered with kites of all shapes, sizes andcolors as thousands attended the 16th Annual Lake Harriet Kite Festival that took place Saturday, January 28, 2017. The free, fun, family festival included horse-drawn wagon rides, snowshoeing, ice fishing, marshmallow roast and an ice obstacle course. Minnesota Kite Society experts were on hand to demonstrate maneuvering spectacular kites throughout the day, offer their expertise to kite flying enthusiasts and to those who are new to the pastime. KiteFest is Sponored by MPRB Events Department, East Harriet Farmstead Neighborhood Association, and Linden Hills Neighborhood Council. Thanks to Our 2016 KiteFest Sponsors! Special thanks to Maryjo Hackett of mjhackett design for creating the 2016 Winter KiteFest Poster! After evaluating and discussing the ice conditions at Lake Harriet today, MPRB has officially decided to cancel this event due to the unsafe ice conditions this year. Unfortunately mother nature has spoken and we will not be able to see all those beautiful kites flying high. Hopefully next year we will have better luck. It was decided earlier this year that in case of extreme weather or poor ice conditions, the event will be canceled and there will NOT be a backup date. The 14th annual KiteFest on January 17 celebrated another recorded breaking attendance year with crowds of outdoor kite flying loving Minnesotans! Be sure to check out all the photos on our website! Thank you to the sponsors and volunteers that provide services, funding and their time to make this event happen. Without you KiteFest would not be the success it has become! KiteFest is brought to you by Minneapolis Parks & Recreation Board, East Harriet Farmstead Neighborhood Association (EHFNA), Linden HIlls Neighborhood Council (LHINC),Minnesota Kite Society and Tips Outdoors. Food and hot drinks from Bread and Pickle, I Luv Coffee Minnesoota! and Sweet Dreams Candy were available for purchase. 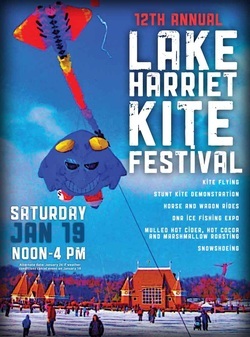 The Minneapolis Park and Recreation Board (MPRB) will host the 13th annual Lake Harriet Winter Kite Festival on January 18, 2014 from noon to 4 p.m. 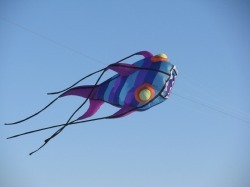 The Kite Festival will take place at the north end of Lake Harriet near the Bandshell. This all-ages regional event is open to the public and admission is free. This spectacular event features kites of all sizes, shapes and colors, hot cocoa and cider and roasted marshmallows over a fire. Other popular events include kids’ ice fishing, horse drawn wagon rides, snowshoeing and music. Minnesota Kite Society experts will demonstrate their skills maneuvering kites throughout the day, and offer their expertise to kite flying enthusiasts and to those who are new to the pastime. Bring your own kite, or buy an inexpensive one at the lake. KiteFest sponsors include East Harriet Farmstead Neighborhood Association (EHFNA), Linden HIlls Neighborhood Council (LHiNC), Minnesota Kite Society and Tips Outdoors. , began at noon with near perfect kite flying weather. The Minnesota kite society brought out the really big kites while helping beginners maneuver the smaller ones. Kids could try their hand at ice fishing under the guidance of Tips Outdoors, try snowshoeing with the help the Park Naturalist or make a hands on activity with the Minneapolis Institute of Art. Although, the day started with 5" of snow dumped on the city, people walked over from their neighboring houses or parked far away and hiked over snowbanks to reach the event. Fun was had by all and the festival was a huge success! The lake was filled with music by Mr. Kite, enthusiastic kite flyers of all kinds and never ending lines for hot cocoa, cider, brats and horse drawn wagon rides! The 12th annual KiteFest on Saturday, January 19, began at noon with near perfect weather that lasted a few hours until the anticipated winds blew in and played havoc with the tents and kites. The Minnesota kite society brought out the really big kites while helping beginners maneuver the smaller ones. Kids could try their hand at ice fishing under the guidance of the DNR or go on a scavenger hunt using clues to search for hidden blue glittery snow flakes. Although, the event closed early, fun was had by all and the festival was a huge success! Sponsors of KiteFest include the Minneapolis Park and Recreation Board (MPRB), Minnesota Kite Society, the MN Department of Natural Resources (DNR), Nicollet-East Harriet Business Association (NEHBA) East Harriet Farmstead Neighborhood Association (EHFNA) and Linden HIlls Neighborhood Council (LHiNC). Thank You 2013 KiteFest Sponsors! A Big Thanks 2013 KiteFest Volunteers! A big thank you to the KiteFest volunteers who simmered and served up hot spiced cider, sold and assembled kites, assisted with the kid's scavenger hunt and the horse and wagon rides. Special Thanks to Kinderberry Hills for donating prizes to the Children's Scavenger Hunt in addition to their sponsorship. 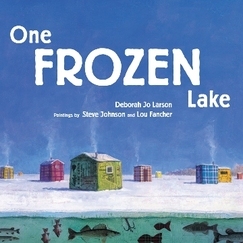 Also, three children each won a copy of One Frozen Lake, signed and donated by author, Deb Larson of Kinderberry Hills and published by the Minnesota Historical Society. General Set Up: 4 volunteers are needed to help with unloading and setting up tents. Cider - 2 volunteers are needed per shift to serve cider and collect donations. Medallion Hunt - 2 volunteers are needed per shift to: Explain instructions to parents and children; Read a clue every 15 to 30 minutes; Award prize to the winner. General Take Down - 4 volunteers needed to help with taking down tents and tables and help load into trucks. Due to several weeks of high temps, the ice on Lake Harriet is not near the required thickness to be safe. Thanks to all the sponsors and to everyone who volunteered to help at the festival this year! 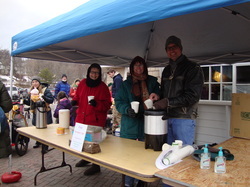 Thanks you to over 40 volunteers who offered their time serving cider & cocoa, selling kites, assembling kites, assisting with horse drawn wagon rides and helping with the kid's medallion hunt. Thanks to you, KiteFest 2011 was the best ever Winter Kite Festival! The 11th annual KiteFest will take place on Saturday, January 14, 2012 from noon to 4 pm at the north end of Lake Harriet by the band-shell. Festival sponsors include the Minneapolis Parks & Recreation Department (MPRB), The Minnesota Kite Society, The Minnesota Department of Natural Resources (DNR), Nicollet-East Harriet Business Association (NEHBA) East Harriet Farmstead Neighborhood Association (EHFNA) and the Linden Hills Neighborhood Council (LHiNC). The Minnesota Kite Society experts will demonstrate their skills maneuvering the really big kites throughout the day and will offer their expertise to those who are new to the pastime. Bring your own kite or buy an inexpensive one at the lake. The DNR Ice Fishing Expo will teach kids ice fishing skills and safety tips. No fishing license is required and the DNR will provide all of the equipment needed to participate. Admission to the festival is free. In case of extreme weather or poor ice conditions, the event will be re-scheduled for Saturday, January 21. Check this website or www.minneapolisparks.org for weather updates the day prior to the start of the event. Despite the cool temps, an attendance estimation of over 2500 turned out to view kites of all types, colors and sizes filling the blue sky over Lake Harriet. Many people brought their own kites or purchase one of the many available by EHFNA. As the kites flew over head, marshmallows roasted over wood burning fire pits, residents sipped on hot cider & cocoa, rode along the parkway in an old fashion horse & wagon and tried their hand at ice fishing. Horse and Wagon Rides - 1 volunteer needed per per shift to assist with loading & unloading riders and collect donations. Floater - 2 volunteers are needed per shift to assist where needed with all events. We Love Our Sponsors and Supporting Local Businesses! A special thank you to the Minneapolis Park & Recreation Board (MPRB) who is the the lead sponsor of this event. Staff from the MPRB, the Linden Hills Recreation Center, Lyndale Farmstead Park, Lynnhurst Recreation Center, and Martin Luther King Park all contributed to the success of this signature city winter festival. EHFNA is grateful for the financial support from these local businesses. A vibrant urban community is the synthesis of healthy neighborhoods and successful local businesses. We thank these businesses for helping our community be the fantastic place it is. A Perfect Day for Kites! 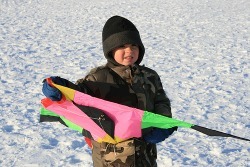 The 2009 Winter Kite Festival on Sat., Jan. 10 was, without a doubt, a memory maker for young and old alike. The bright sun and blue sky, hundreds of visitors (of the human and dog variety), magnificent kites and myriads of activities and treats made for a perfect day we will remember for a long time. Thank you to everyone involved in this event - especially all of the organizers and volunteers. CLICK HERE to visit the Kite Festival page on this website where you can view all of the photos from the event! The 2009 Annual Winter Kite Festival could not have had better weather. There was plenty of sunshine and a beautiful winter blue sky throughout the day. Light winds lifted the big kites into the air without driving the wind chill to an uncomfortable level. The high temperature of 17 degrees was a reminder Minnesotans are a hardy bunch that won't let a little cold get in the way of having fun. The ice was thick; the snow was crunchy. As one person exclaimed "this is exhilarating!" It is hard to measure the number of people who attended this free event, but some estimates put attendance at nearly four thousand. The Minnesota Kite Society and Mr. Kite (a.k.a. Craig Christensen) flew the big kites, one of which was in excess of 250 square feet! Equally impressive were the hundreds of kites of all shapes, sizes and colors dotting the sky over Lake Harriet flown by residents who brought their own or purchased them at the event. "I haven't flown a kite since I was 10!" remarked a grinning new kite owner. 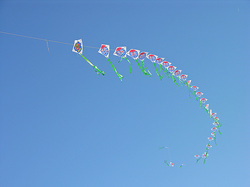 One hundred and fifty kites were sold by EHFNA volunteers. While the kites flew overhead, marshmallows roasted over a wood burning fire pit. Gallons of hot chocolate and mulled cider warmed hands. The DNR fishing expo offered a hands-on education. Young and old enjoyed the trip along the lake in the horse and wagon ride. The Park provided snowshoes so people could experience this 6,000 year old means of getting around through deep snow. Grandparents helped grandchildren search for hidden golden pine cones in the Scavenger Hunt. This year's Kite Festival story would not be complete without mentioning Alice. Last year, one young girl who was helping with the Kid's Scavenger Hunt said to me, "I want to be an official volunteer next year." "Absolutely," I told her, shaking hands on the deal. Unfortunately, without her last name, we were unable to contact her. Much to our delight and surprise we found Alice waiting at the band shell when we arrived that morning! Alice had been waiting all year to be an "official" Scavenger Hunt volunteer. And this year she brought her own volunteers to help with juggling during the riotous countdown: her dad, Michael, and her brother Elliot are jugglers! Thank you to the Lyndale Farmstead Park and Minneapolis Parks and Recreation Board, the many co-sponsor organizations and to all of the volunteers for making this community event a day of lasting memories. 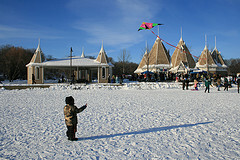 Another fun filled and well attended Winter KiteFest was held Saturday, January 9th, 2010 on Lake Harriet. There were plenty of family activities including ice fishing, horse-drawn wagon rides, snowshoeing, a kids medallion hunt, and a marshmallow roast. Thousands of cups of hot cider and cocoa were served on this cold, but beautiful sunny winter day. The Mr. Kite and the Minnesota Kite flew the big kites with Minnesota Kite Society members demonstrated their skills maneuvering spectacular kites throughout the day. The DNR Ice Fishing Expo had over 850 visitors who learned ice fishing skills and safety tips. On behalf of all of our sponsors, supporting local businesses and our volunteers we hope you had a great time. We are looking forward to seeing everyone next year at the 10th Anniversary of the Winter KiteFest! Thank you to our volunteers that braved the cold serving cider, assembling kits, helping children find the blue snowflake medallions and assisting with the horse and wagon rides. We thank the organizations who co-sponsored this event with EHFNA and the local businesses who provided financial support for this event. Community events like KiteFest would not happen without your help. Click on the Kite Festival Page to view a complete list of volunteers, organizations and local businesses that supported Winter KiteFest 2010.